International celebrity "My MBA degree helps in understanding the professional management approach in Bollywood. 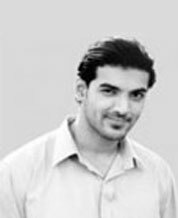 It helps me understand the strengths of 'John Abraham' the brand and maximise my earnings. The MBA has given me a sense of worldly wisdom and empowers me to utilise my resources to the fullest."